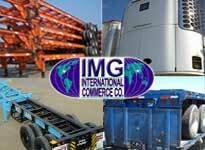 IMGInternational Commerce Co, sells Used 40 Foot Straight Frame Container Chassis. This is a 40 ft fixed axle chassis with Straight frame. It Carries one 40 ft standard ISO Container meets all DOT, TOFC, AAR, FMVSS, ANSI, SAE and TTMA specifications. We sell and export Used 40 Foot Straight Frame Container Chassis in “as is” condition or in “remanufactured” condition. Length 40 ft 6“, width 96 inches. Two axles, king pin location 301/2’ from front of chassis. Spring suspension, 12 inches I-beams, chassis weights aprox 6,600 lbs. Chassis are usually sold in bundles of 5 chassis.